At all levels, our court systems and legal service providers are struggling. Providers have fewer resources to deliver adequate civil and criminal legal services necessary to address the unmet legal needs of our nation’s poor, near-poor, and those of moderate means. Large corporations and others who can afford the cost of litigation often turn away from the courts because of delays, inefficiencies and legal costs. The inadequate funding of our co-equal, third branch of government has contributed to an erosion of public confidence in our courts. However, the challenges in both the civil and criminal justice arenas are not only due to inadequate funding. Rather, they are greatly exacerbated—if not partly caused—by the hesitancy of many in the legal profession and the business community to acknowledge and seek correction of the shortcomings of the justice system. Whether those deficiencies are rooted in a lack of cultural and language awareness, racism or sexism, bias, power inequities, or even professional self-interest, they have made justice unobtainable for many in our nation. We have failed to recognize the criticality of access to justice for not just some, but for all. This is the very essence of the American rule of law, and it is our duty to ensure that it never falters. To achieve justice for all in our country, we must work collectively to assure that our court system is strong and that our judiciary remains independent. It must be not only for and when our own interests or those of our clients are at stake. Rather, it must be so each time we see injustice, lack of access, attacks on the judiciary, or services rendered by the justice system that fall short of what Americans are guaranteed by our Constitution. We cannot stand silent and turn a blind eye. There are concrete ways that individual lawyers and judges immediately can contribute to rekindling trust and confidence in our American justice system. Our country’s state and federal judiciaries face vitriolic attacks. We have heard politicians assail judicial integrity and competence and others stand silent when they do. Left- and right-leaning social media outlets selectively push out stories of too-light or too-heavy sentences; verdicts that are too large or too small; and seemingly aberrant results, without context, to undermine public confidence in our legal system. Legitimate criticism of the jurist who fails to honor the rule of law should never be suppressed, yet, too often lay colleagues and some within the legal profession find it far too easy to attack the presiding judge rather than to simply disagree with the merits of a court decision. We must never tear down the integrity of a jurist simply because the outcome of the case was other than that which was sought. The cumulative damage to our justice institutions resulting from judge-bashing, even if only shared in a whisper to a client by a lawyer, cannot be measured by simply totaling these individual acts of criticism. Collectively, those acts blend and combine over time to undermine the public’s confidence in our justice system. Simply put, we lawyers need to lead—and lead by our acts and words—if we expect our clients and the public to have respect for the justice system. Each of us who plays a role in the justice system must go about our daily work with recognition that the hallowed halls of justice belong to the people. We must do all we can to assure that courts are places of fairness and equality; we must give life to the notion that they are “the people’s courts.” In my state of Louisiana, we had a federal district court jurist who had a “welcome” mat at the door of her federal courtroom. Each hearing day, she would come into the courtroom and introduce herself to all present. She was known to have said that she was always striving for a “user-friendly legal system.” Whether you agreed with her ruling or not, you had a sense that the process was fair and that, whether lawyer or litigant, juror or witness, you had been treated with respect and dignity. Certainly, our judges on the state bench do not have the luxury of time to introduce themselves to the scores of self-represented litigants or overworked appointed counsel who crowd courtrooms every day. Yet, in both the civil and criminal arenas, even in the face of overwhelming dockets, there are inspiring examples of jurists who make a difference by small acts of patience and understanding that lend assurance to both intimidated first-time litigants and habitual users of the system. They do so with empathy as they look at the hardened face of addiction and seemingly incorrigible crime. They explain their rulings so that those who come before them see the court as an institution of civility and accountability. They sense what it feels like when you walk into a courtroom and no one is of your race or gender, and they undertake efforts to assure that staff and jurists reflect their community. They remain steadfast and calm in the face of disrespect when there is simply no one else to save a broken life. And, they recognize the fear that a self-represented litigant may experience as she stands to tell intimate details of a relationship that deteriorated to sexual violence. By demonstrating respect and fairness, they are building trust and confidence in our justice system. Similarly, lawyers can do their part to help build trust and confidence in our justice system by educating those whom they represent about the rule of law in our society and the court’s role in upholding same. Helping them understand that justice ultimately is defined by fairness of process, integrity in purpose, and ethical means in adherence to the rule of law, and is not always found in victory, can be one of the most important lawyer-client conversations to be had, and it will go far in building trust in the justice system. We also know that serving our communities is an important way to instill confidence in our justice system. In Louisiana, we are fortunate. Although our justice system is woefully under-resourced in almost every aspect that matters—from understaffed police departments, prosecutors, and public defenders, to our antiquated and inadequate courthouses and technology systems, to our overworked court personnel—a bright spot is our judiciary, the majority of whom understand that their role as jurists, as leaders in the law, does not start and end with the sound of a gavel. They serve as community leaders throughout their careers on the bench. They step up to serve as presidents of local bar associations, contribute to the state bar and bar associations of color, lead the local chapter of the federal bar, and serve in leadership within the American Bar Association. They serve regularly in soup kitchens. They go out into their communities—whether at synagogue, school, or neighborhood center—to speak and, mostly, listen. They donate their time to causes for access to justice and beyond. They don’t do it for recognition. They do it because they care. Our judges know, as urged by Jesse Rutledge of the National Center for State Courts in an earlier article in this series, that they need to do their share, each day, to earn the trust and confidence of the public which they serve. Understanding the challenges faced by their fellow community members through listening and outreach before community members seek justice in the courts is an important first step for those judges who want to earn the trust that leads to sustained judicial independence. But what more is needed to instill public trust and confidence in our courts? Lawyers, judges, and court administrators must take even greater steps to innovate the way that justice is dispensed. However, to innovate, we need to better understand the public’s expectations regarding access points to justice and how we can address their legal needs. We need to make rendering justice less about how we always have done it and more about how it makes sense to do it now. We need to think collaboratively with those within and outside the legal profession about why our courts are seen by some in the public as a place for judges and lawyers to work and earn a living rather than as a place for the public to have their life problems resolved. We need to innovate through technology and smart justice system improvements. We need to examine everything from court rules to regular court hours; financial forms to fines and fees. We need to determine if our assumptions, biases, practices, procedures, and traditions degrade justice-seekers, or worse yet, deny justice. The bottom line: We need a justice system transformation in which the best building blocks of the system survive and the vestiges that no longer lend value are abandoned. That transformation will instill a renewed sense of trust and confidence. The legal profession of lawyers and judges and all those who have the privilege of delivering legal services to the public cannot leave it to those in future years to restore trust in our justice system. It will be too late. We must do our part, individually and collectively, to make the concept of justice a reality for all. This is our moment to get it right. To get it right for those whom we serve. Judy Perry Martinez is the President-elect of the American Bar Association. 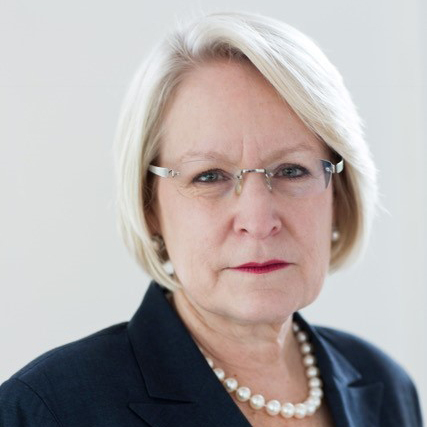 Of counsel with Simon, Peragine, Smith & Redfearn in New Orleans, she served as chair of the ABA Commission on the Future of Legal Services (2014-2016) and is special adviser to the ABA Center for Innovation. She has also chaired the Standing Committee on the Federal Judiciary from 2011 to 2012, is a past member of the House of Delegates, sat on the Board of Governors from 1996 to 1999, and served as former lead ABA representative to the United Nations. She received her J.D. in 1982 from Tulane University Law School.